No, they won't because Steam Greenlight only supports new, original games, not tools. Hi, is it possible to tie Account to MC Instance ? Reason: I need to run more instances simultaneously. Its possible by copying instance and running more copies at once (every copy with different Account of course). However I should select my Account (top right corner) every time I start instance. Tying Account to instance would be perfect solution. It was decided to not implement this, see #209 for a short explanation. You might also want to comment on that issue with your usecase, in case we change our minds. Anytime I try to download it, I always get an error, any ideas on how to fix this..? I need to download this to use a certain mod that I'm unable to use with a different launcher. It doesn't matter if I go straight to the main site, or try to download it from a third party ( You know, Google searches ) , I always get this. Maybe try from another computer, and use an USB stick or similar to carrie the archive over? Also do NOT use any third party sides, some of them are not very trustworthy. The only other computer uses the exact same programs as me, I don't think it would make much of a difference, not to mention I'm not allowed to use it because I have my own personal computer, and the other one is one as well. Also, I don't think I'd get a virus from a third party site, I have Avast and multiple adblockers, so even things like Adfly ( To shorten links, I guess..? ) get blocked, I think I'm fairly safe, and all fake download buttons are always blocked / hidden as well. Well to begin with, saying you don't need to watch out for fishy/shady stuff on the internet because you have antivirus is like saying having a fireplace a meter from a house of wood is alright since you have an insurance. Never, NEVER, rely solely on antivirus. It does not, and will never, catch everything. The first one, I get taken to the download page, which I've been able to get to, it's just when I actually click Download for Windows it gives the error, and for the second site, it gives the error right away. 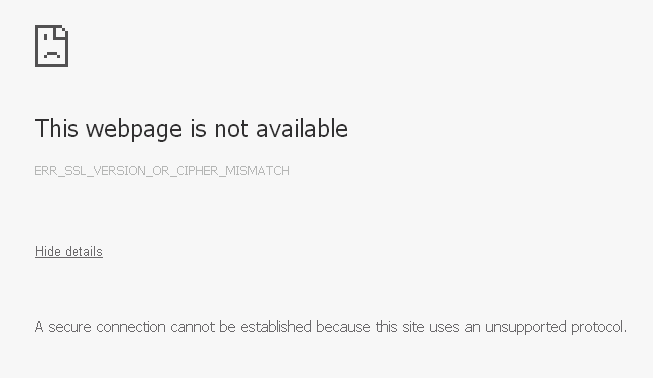 Ok, so some issue with SSL certificates then. Try upgrading your browser (or try a different one) and also make sure your system has up-to-date certificates (in case of Windows you get them through Windows Update). If this still doesn't work you can replace the "https" bit in the download URL with "http" (removing the 's') and it should work. It is possible that you'll run into further issues later when running MultiMC though, but it might get you further in case it's an issue with your browser. so, I'm trying to install 5zig with optifine for 1.8.8 with mulitmc5, I had 1.8 with both, but I can't get it to work on 1.8.8....any ideas? It does show up inside the instance > mods folder, but with "disabled" appended. if you go into your games Mods folder and rename the file and remove the ".disabled" portion, then the next time you play it should be enabled... that said, make sure that the versions of both the mods, forge, and Minecraft are the exact same... if MC and Forge are for 1.8 and the steam mod is for 1.8.8 then it will NOT work and that may be why the mod was automatically disabled. also, does that steam mod have any dependencies? ie does it REQUIRE some OTHER MOD to be able to be used? as an example, if i try to add Thaumic Tinkerer... but if i DON"T have Thaumcraft itself added, then the Tinkerer mod won't work... could that be happening to you? I was going to try removing the appended "disabled" manually, but was nervous of messing something up - I'll give it a shot, thanks. Power Advantage is the base mod for Steam Advantage, but it's in there, so missing dependencies aren't an issue AFAIK. Also, the same set up (game version, Forge, mods, etc) works fine using the standard launcher, and the Steam Advantage mod is present and functional in-game - it only gets kicked using MultiMC. Weird, huh? I'll try removing the "disabled" & see how that goes. My problem is this. I am using MultiMC with a 1.8 modpack I'm putting together. MultiMC says "There are no 1.8 versions of LiteLoader available." I download LiteLoader 1.8 snapshot from the Jenkins build. Now, how do I get MultiMC to accept it? "Add jar mod" doesn't work with LL, and it doesn't work with a Forge-LL-1.8 jar combo mod in any combination since 1.8 is still first in the list and overrides the jar mod. just put liteloader in the mods folder, it will load up like a forge mod. The first did nothing, but the second worked! Thanks! I went to settings, Minecraft section and checkmarked the option to open maximized but it still opens in the regular little window....?